The words were iffy, but the tone was loving, and I knew my friend meant well when he tried to dissuade me from taking up golf. I ignored him. I mean, how did he know how good (or bad) I would be? I can spot an off-center window even if it’s just half-an-inch; surely, it couldn’t be that hard to line up a putt. It’s not like the hole moves, for crying out loud. How hard could golf possibly be? Pipe down, all you links-lovers out there. (I don’t really want an answer; that question was the rhetorical sort.) And besides, having played a grand total of two lessons, one clinic, and 12 holes now, I’ve pretty much got the picture. You have to get the grip right. And keep your eye on the ball. And make that “L” thing with your arms. All on top of trying to find a skirt that looks halfway cute. I get it, okay? It’s not easy. 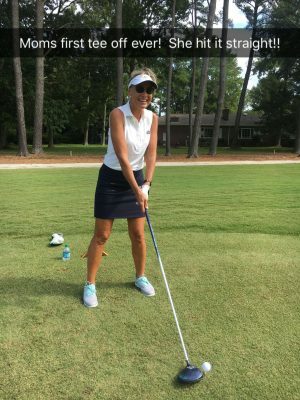 Especially when every time you think about grabbing your clubs (and I’m up to three now; my plan is to learn them one at a time, then add on), you hear a voice in your head saying: You’ll never be good. You’re too old. 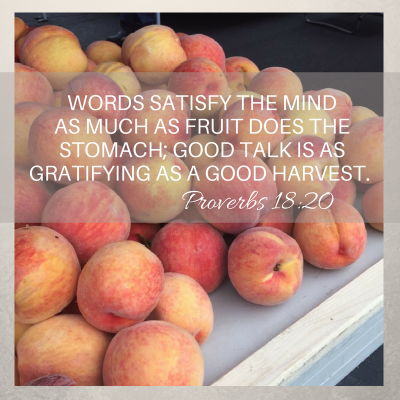 In fact, words satisfy the mind as much as fruit does the stomach; good talk is as gratifying as a good harvest. Words kill, words give life; they’re either poison or fruit–you choose. That’s Proverbs 18:20-21 in The Message translation. And it raises a couple good points. Like the fact that what we say (even in the nicest of ways, bless her heart) can build people up, or rip them apart. Our words can bear fruit…or bring poison. And it’s up to us to decide. But instead of dwelling on all the ways we’ve gone wrong (which would be like talking about how many times I chunked it in the clinic last week, which is how I wound up Celebrexed in the bed), let’s look at how we can do right. Like, instead of cursing someone (whether it’s with a four-letter word, or a slur on their golf game–or their parenting style, or whatever), let’s look for ways to build up. Let’s be alert to the opportunities God gives us to encourage. To speak freedom and hope. To spark joy. Let’s be Givers of Life. But…let’s also be honest. On our own, this job might be tough. Our fuses are short, and our speech patterns (which in my case tilt toward sarcasm) may be pretty well set. 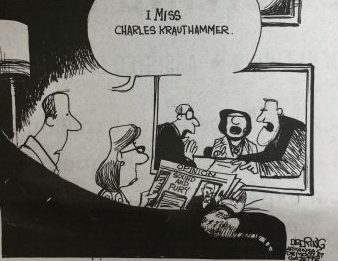 Plus, Charles Krauthammer–who never used a bad word when a really good one would do–is gone. Thankfully, though, we don’t have to go it alone. We can enlist the Lord’s help. Even now, Philippians 2:13 reminds us, he is at work, giving us the desire and the power to do (and say!) what is good. 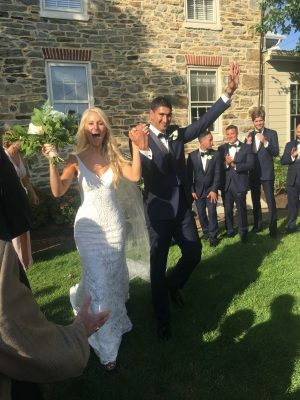 Our niece got married last weekend. Twice. 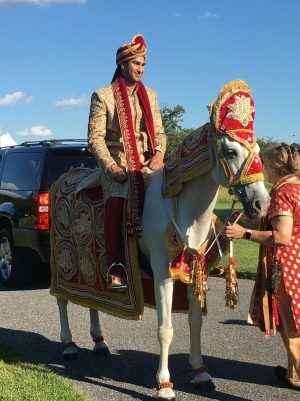 Caroline’s beloved is of Indian descent, and the first ceremony featured a bevy of gorgeous sari-clad guests, traditional Indian dancers, and a spectacular procession (the “baraat”) led by the handsome groom on a majestic white horse. Both nuptials took place on the farm where Robbie grew up (and where we were staying for the weekend). 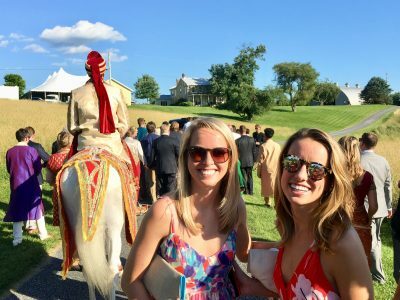 Having married off two of our own daughters in back-to-back weddings three years ago, we knew exactly what our family should do. Happily for us, the Maryland countryside is crawling with Berndts, and we decamped to Robbie’s sister’s home, where our brother-in-law Noby played host. Noby tells people that he’s in insurance (and I guess he probably is), but I don’t think that’s why God created him. I am pretty sure that God made Noby because the world needs more energy, more excitement, and more contests you can’t stage indoors. 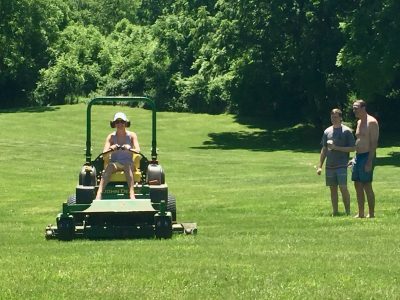 “Camp Noby” has all the stuff you might find in a typical American yard, stuff like bocce ball, corn hole, and ping pong. But Noby has other stuff, too. Stuff like Blow Darts. And Chinese Death Stars. And a big field with a John Deere tractor designed not so much to mow as to race. As Noby demonstrated the how-to’s of each successive competition in what turned out to be a decathlon, I felt like I was watching a bizarre farmer’s version of The Hunger Games. The operative word here being watching. I had no plans to participate in the official events. My best sport (as anyone will tell you) is tanning, and as I lay there by the pool while the rest of the family tried not to kill themselves, I knew I led the pack by at least three shades of bronze. If you’re a mother, you know what that means. Especially during a farm-country decathlon. You get up to see who’s been stabbed. As it turned out, all the kids wanted was for me to hit something. Having gone to all the trouble of getting out of my lounge chair, I obliged. I picked up the nearest piece of equipment, which happened to be a Bigfoot-sized crossbow. Noby showed me how to load the thing (if that’s the right term? ), and explained all about how to use the scope and the importance of keeping the safety on until I was ready to go. I took it all in, flipped the switch, sighted the target, and pulled. Nothing happened, so I pulled again. Still nothing. My arrow sat snug in its groove. Alrighty then. I went back to square one, pulled the darn thing, and came THIS CLOSE to the bull’s eye. Everyone cheered, but the whole experience was more than a little humiliating (and not just because I was wearing a bathing suit to shoot a lethal arrow in front of 12 people, only four of whom actually have my blood in their veins). I realized that, if I ever confronted something–or someone–I had to kill, my only chance would be for them to die laughing. All of which reminded me of an convo I had a few months ago with my friend, A.J. Tata. A.J. (“Tony”) is a retired brigadier general, a best-selling author (check out Besieged if you like save-the-world stuff), and a national security expert who’s always popping up on CNN and Fox News. He’s seen his share of bad guys, and I figured he’d know how to size someone up. Oh my goodness, people! Tony was talking about how a soldier handles a gun, but he might as well have been pointing at me! Let’s review, shall we? The Bible is meant to animate our actions. To shape how we think. To be used in our lives. But if we aren’t comfy with it in our hands (or our heads), it’s not going to work all that well. We’ll be hesitant. We’ll make mistakes. We’ll be awkward. But here’s the thing. We don’t have to enlist in some army, or go to the Bible version of Camp Noby, to get ourselves up to speed. God has already equipped us with all that we need. We have the Bible. We have the Holy Spirit (whose job is to translate God’s message into our hearts, and give us the power to use it). And we have each other. It’s like having your very own Noby, keeping you pointed toward the goal. And honestly? The more experience we get–the more we dig into Scripture and let it animate our hopes, our prayers, and our dreams–the more our lives will begin to line up with God’s plans. And the more of his bull’s eyes we’ll hit. Give us the training and experience we need to use the Bible–our “sword”–wisely and well. At least that’s what the Bible says. But…how often, or how much, do we truly believe that? A couple of weeks ago, I shared a post about how we can’t let anyone label us with the wrong name, because God calls us “Beloved.” And this week, as we look ahead to Father’s Day, I am thinking the same thing holds true for God. No matter what our concept of “father” might be, we can’t saddle our Heavenly Father with any names that don’t fit. God labels himself. And thankfully (incredibly, actually), he tells us exactly who he is, so we can know him. And so we don’t get it wrong. He is faithful (even when we aren’t). He is patient (even when we are super slow). 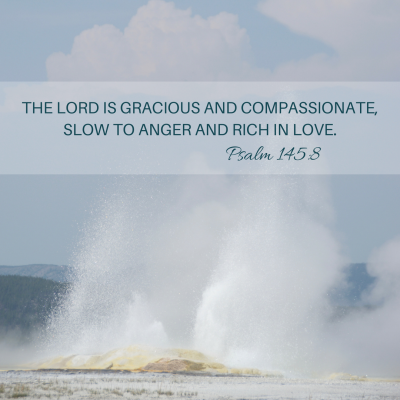 He is loving (even when we are the worst kind of un-lovable). If you really want to dig into who God is (and what that means for our lives), grab a copy of Ruth Myer’s book, Thirty-One Days of Praise (which you can find featured on my bookshelf right now). It’s a resource I turn to, again and again. Why? Because it is just so darn easy to get things mixed up! Instead of taking God at his word–believing he is who he SAYS that he is–we sometimes put him in a box. We negate his nature. We put limits on his love. How could he love me, after all that I’ve done? How could he possibly care about my little problems, when there is so much that is wrong with the world? All of which is a bunch of… I was going to say a word I don’t let my kids say, but I’ll just go with “baloney.” And not only is it baloney, but it is also (buckle up, cuz this part is not pretty) jaw-droppingly arrogant. I mean, who are WE to say what God can or can’t do? He says he loves us. He says he’ll provide. He says he’s got everything under control. We don’t have to understand all this stuff for it to be true. P.S. If the idea of a Father who does “what’s best” and who is “ablaze in beauty” feels foreign to you–either because you don’t really know God that way, or maybe because your earthly dad colored your world with a not-great perspective–you’re not alone. For years, I’ve loved getting weekly encouragement via email from Sylvia Gunther, and this week she shared her own painful journey being physically and emotionally abandoned by her father. To read her story–and discover who you really are, as God’s child–click here. That’s Jesus, outlining the whole reason he came. The whole reason he died. The whole reason why we can live free. So…is the “blue marble movement” a Jesus-y thing? I don’t know. I looked it up on Instagram (@bluemarbleday) and the organizers cite the Bible as one of their texts (along with a few other not-Bible books), and the three tenets that undergird what they are doing–encouraging gratitude, promoting hope, and kindling love–are three things I’m pretty sure Jesus would like. I do too. But the lack of any overt mention of Christ got me thinking. Not about the Blue Marble People (cuz I think what they are doing is great; who doesn’t need to be more intentional about things like gratitude? ), but about my own self. And about whether my idea of abundance parallels his. 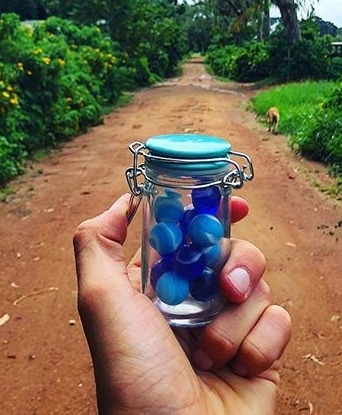 Like, if I were going to put a marble in my jar at the end of the day, it would probably be because I’d enjoyed some combo of coffee, exercise, time spent with people I like, and time spent with God. 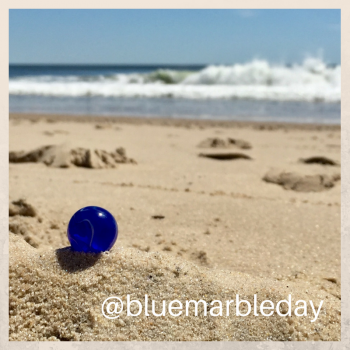 And if I had done something truly significant–something like, say, moving my winter clothes out of the closet so that the cute summer tops could come in (a task I have yet to accomplish in 2018)–I might even give myself two, and call it a Blue Blue Marble Day. But is that what Jesus would say? Like, is checking projects off the to-do list part of his “abundant life” vision? Is treating myself to a venti-sized latte what he meant when he said I could live life “to the full”? Is it really all about getting…exercise? The root word for “abundantly” [in John 10:10] is perissos, meaning “exceedingly more, going past the expected limit.” The word for”life” is zoe, and it encompasses our physical presence and future eternal existence. The author went on, contrasting the world’s definition of abundance with God’s: If abundance is exceedingly more, going past the expected limit of life, we’ve got to check our hearts to be sure we’re not just expecting God to produce exceedingly more, going past the limit of stuff. It’s the age-old struggle: Do we want more of what God can give us, or do we want more of God? Obviously, we have to want God more than stuff. But what happens when we don’t? What happens when we turn to things like Netflix or date nights (or, in my case, tidy sock drawers and lattes) to make us feel good? To fill in the gaps? To help us relax or re-charge? At least that’s what Jess Connolly says. She’s the gal who wrote my beach book, which is all about pursuing holiness (instead of just rule-keeping), embracing grace (the transformative kind, not the stuff that just winks at our sin), and stepping into abundance (as in, the for-real life God offers). 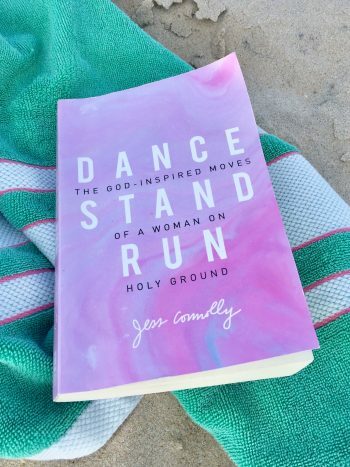 The book is called Dance, Stand, Run: The God-Inspired Moves of a Woman on Holy Ground. And, for whatever freaky reason, it’s just $3.79 on Amazon right now, so if you want it, click here. This summer, when you find yourself facing a need (whether it’s a desire for peace, or more energy, or just to feel better and more confident about what life looks like right now), press into Jesus. Trust him to supply what you lack. Take him at his word–that is, give him the chance to show you who he is, and what he can do. And then, at the end of the day, give yourself a blue marble to remind you how all-sufficient God is, and how incredibly much you are loved. Thank you that Jesus came so that we could have life, and have it abundantly. Help us take hold of that promise, knowing that as we draw near to you, you will draw near to us. Let us find our deepest satisfaction and joy not in your gifts, but in you. (John 10:10, James 4:8, Psalm 90:14). 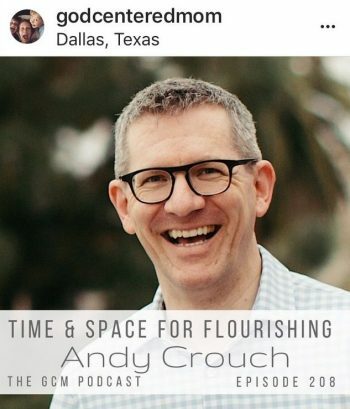 This week, Heather’s guest was an author I love, Andy Crouch. Andy has written a slew of good books, including one called The Tech-Wise Family: Everyday Steps for Putting Technology in Its Proper Place. He talked about how to do that–how to live in a techno-based world, without letting devices control our thoughts, our time, or our relationships. To listen to the podcast, click here…and in the meantime, I’ll give you the Cliff Notes. Andy is big on pulling the plug. He’s not anti-technology; he’s just into “active-engagement”–as in, things that captivate our kids (and us) in ways that go beyond screen time. When we look back on the “best moments” of our family’s life, nobody is going to say “It was when I got to Level 16” on Fortnite, or whatever. Instead, Andy says, it will be those times when we were really “present” for each other. When we were engaged. Andy and his family take a two week vacation every summer and completely unplug. For those who find that prospect daunting (hello, Berndt fam? ), he gives the okay to start smaller. Even just one hour sans screens–no TV, phones, computers–can make a big difference. Chez Crouch, they even douse the lights during dinner and dine by candlelight. But here’s the thing about ditching devices. The first third of any new endeavor, Andy says, is often the rough part. Get through that–get through the first 5 days of your two-week techno-vacation, or the first 20 minutes of your techno-free hour–and the lightbulb (or more aptly, the candle) ignites. Things get creative. Things get engaged. Things get fun. We didn’t even have screens when our kids were young (unless you count one big box TV), but when it came to any sort of “mandatory fun,” the burn-in time was still real. Most of the stuff I’d suggest was not greeted with cheers, but once we hit our stride, we were hooked. Or at least most of us were. Star-Gazing. Invite another family, pull out the big blankets, and hit the backyard. Have a few convo-tips at the ready (What are three things you liked this school year? If you drove across the country, name two friends you’d want to have in the car. If you could learn to do one new thing this summer, what would it be? ), and add ice cream sundaes, or maybe Bomb Pops, to the mix. The Original Audible. Turn the lights down low and pick a good book. Have mom or dad read it aloud, or invite older kids to jump in. The Narnia books are always a fav, but we discovered others by accident, just because they were on the school’s “Summer Reading” list. Both The Bronze Bow and The True Confessions of Charlotte Doyle were winners with all of our kids. Game Time. We’ve never been all that big on board games (too many pieces look like kibble to dogs), but three years ago, Salad Bowl was a stay-cation hit with the college crew, and Would You Rather is still a staple on every car trip. I’m sure you have other ideas; post a comment if you’ve got one to share. And P.S., Andy’s pointers are not just for kids. There’s a whole section in the podcast devoted to grown-ups, and how our technology obsession can negatively impact our world. Want to sleep better, fall more in love with your spouse, or wake up without being greeted by email, first thing? Get the screens out of your bedroom.